This blog post was featured in the September issue of DaytonLocal.com post written by Dana Morgan. The most important document you will write, use, and submit during your job search: the resume. Dana Morgan, career counselor with Lee Hecht Harrison, our featured guest of the month is here to offer her expert insight on the resume. While there are many varying opinions on the format, content, and even layout of the resume, Dana will hone in on features of the resume that remain tried and true. 1. 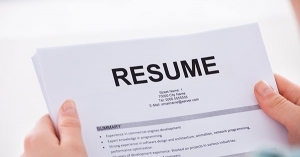 How important is a resume in the job search these days? A resume is still the centerpiece of the job search, despite the technology advances that have impacted today’s search process. The resume remains a foundational document that a jobseeker uses in the job search, and it’s difficult to conduct a successful search without a polished resume. Once your resume is complete, all of your other communication pieces should be consistent with it: the LinkedIn profile, your business cards, and your verbal “elevator speech.” Writing the resume helps you focus your job search and understand what skills you bring to the table. 2. What are the most important items to include in a resume? When hiring managers review a resume, they want to see a clear and concise overview of where you worked, when you worked there, and what you did on the job. The “where, when, what” rule should be applied to each position you’ve held, going back in time for each position in reverse chronological order. It is also important to define the skills that you used in your past positions. Skill words should be based on objective “learned skills” such as Excel spreadsheets or financial analysis versus subjective “soft skills” such as hard-workingand team player. If your learned skills match the skills hiring managers are looking for, your resume will be advanced to the next level. At the top of the resume, it is helpful to include a brief summary that gives an overview of your experience and the skills you bring to the table. This is your opportunity to position yourself the way you want an employer to see you, and allows you to highlight the aspects of your background that fit the job description you are applying for. If there is a specific list of responsibilities for a particular position, take the time to match the skills in your summary to the skills listed in the job description. It is wise to include details about these skills (where/when you used them, and in what capacity) for each position you detail below. 3. What are some items to avoid including in a resume? The first is personal information. It is never wise to divulge age, race, or health-related information. The second thing to avoid is hot-button issues such as political affiliation, religious denomination, membership in certain groups, or other controversial topics that people may feel strongly about. Remember that when you include volunteer activities, you may be revealing aspects of your life that you didn’t intend to. Also, be careful about going back too far in time on the resume. Generally, you should list positions going back about 10-15 years. The magic number is 20: anything going back in time beyond 20 years may work against you. You should also stay away from any discussion of salary or hourly wage. This topic is better left untouched until much later in the interview process (ideally, after an offer is on the table). Naming a salary/wage figure on the resume is likely to work against you. Lastly, avoid talking about why you left your former company or why you are looking for a job. Especially remove any references to a former position or company that could be construed as negative. 4. How do you feel about a chronological versus a functional resume? I am convinced that a chronological resume will serve you better in almost every hiring scenario. Hiring managers want to see a very clear history of your work experience that they can understand at a glance. A functional resume requires much more time and effort to try to understand what a candidate has to offer. I highly recommend a chronological resume because it is much more effective in getting your message across to your target audience. 5. What resume myths do you wish to dispel? Probably the main myth I hear is that the resume should be one page. However, almost every resume I’ve written is two pages instead of one. The one-page resume is effective for a current college student or a recent graduate with very little experience to discuss. Anyone with five or more years of experience and multiple positions to describe is welcome to use two pages for the resume. Hiring managers would prefer to see a two-page resume that effectively conveys important information rather than a one-pager that doesn’t offer enough detail. 6. What tools do you recommend using to compile a resume? First, it helps to select a pre-designed template to help you keep the formatting consistent throughout the document. If you google “resume template” or “resume builder” you’ll find plenty of options. I suggest you choose a template that gives you optimal room on the page, typically with the left and right margins set at about 1”. I also suggest using a tool like Careerbuilder.com or Monster.com as a research tool to look up good verbiage to build your job description. For example, if you have been a bank teller for many years and you are struggling to create a description of what you did in this role, I suggest that you look up “bank teller” in the search bar on Careerbuilder.com to find job descriptions for bank teller roles. These job descriptions are full of great verbiage that you can plug into your resume to help you describe what you did in the role. Lastly, take a look at the endorsements you’ve received on LinkedIn. The appropriate skills you’ve been endorsed for should be included on your resume, and vice-versa. 7. For those wishing to transition to a new career field, what is your advice for creating the resume? This advice may not be consistent with what others may say, but I still feel that a chronological resume is the best tool to use versus a functional resume, even in a career change situation. However, I do recommend revising the summary to strategically position you for your next career. Focus on the skills you’ve used that will transfer to the career you are targeting. Again, to check what skills the new career requires, take a look at job descriptions on Careerbuilder.com as a research tool, or look at profiles of people on LinkedIn who currently hold the job title you are seeking. Thank you, Dana, for offering such sound advice on the resume. Any job seeker would benefit from your expertise! Copyright 2012-2019 Avada | All Rights Reserved | ITsHRc, LLC.